Autocrine cells both produce signalling modelcules and respond to them. AN example of an autocrine system is signalling through epidermal growth factor (EGF) receptor (EGFR). A cell releases EGFR ligands into its environment, and a fraction of the released ligand is recaptured by the receptors at the cell surface. The activated receptors then trigger a signal transduction cascade, whose effects range from cell proliferation to cell migration behaviour. An additional effect can be the further production of EGFR ligands, producing a positive feedback loop which results in a sustained activity of the autocrine signalling circuit. If, as hypothesised, this sustained autoendocrine circuit is localised within a defined domain of the cell, then it may contribute to the intrinsic cell polarity or assymmetry. The difficulty associated with the experimental investigation of autoendocrine signalling makes computational modelling especially valuable when trying to deduce nature of the molecular mechanisms underlying signalling circuits. In the Maly et al. 2004 publication described here, the authors develop and analyse a dymanic computational model of autocrine EGFR signalling. Their description is based on integrating select elements from the models of Kholodenko et al., Quantification of EGF Receptor Signalling, 1999, and of Huang and Ferrell, MAPK Cascade, 1996, into the existing model of EGFR aurocrine signalling bt Shvartsman et al., 2002. It should be noted that although the original Maly et al. model is a spatially distributed dynamic computational model, the spatial parameters in this CellML description have been removed, as CellML is currently unable to handle spatial parameters. The model is still dynamic. Components of the autocrine EGFR signalling system and their interactions in the model. Transport, covalent modifications, and protein binding processes are shown by solid arrows. Catalysation is shown by a dashed arrow. 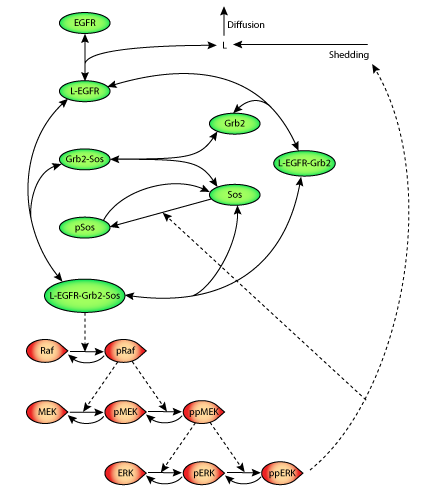 EGFR is a receptor of ligand L; Gbr2 is an adaptor protein; Sos is an activator protein, Raf, MEK and ERK are protein kinases; p denotes the phosphorylated form of a protein and pp is a double-phosphorylated form. Model siumulations supported the hypothesis that autocrine EGFR siganlling circuits could contribute to the generation and/or maintainance of intrinsic cell spatial polarity, possibly realted to migration as ell as tissue organisation. Derived from workspace Maly, Wiley, Lauffenburger, 2004 at changeset a650bb380cac.